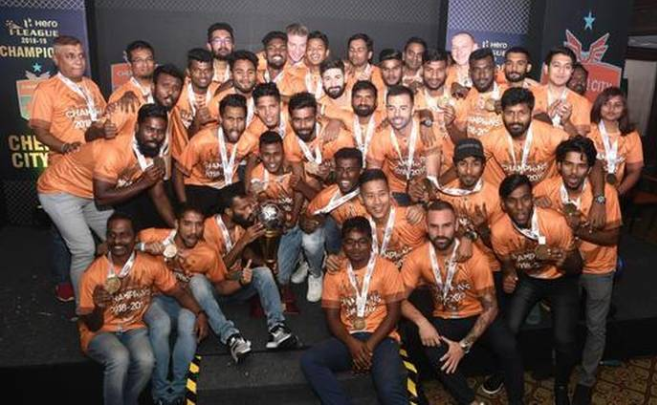 Chennai City FC lifted they maiden i-League trophy in front of representatives of other clubs and bigwigs of All India Football Federation (AIFF) at a function in Chennai on Wednesday. "Chennai City has by far been the best team this year. It's brand of football of keeping the ball to the ground, the passing game. That’s what we in the national team have been trying to put in place," he said. Dhar also spoke highly about the teams' promotion of local players from their respective regions as the way forward. Chennai City has been doing it for the last few years. It helps grow the fan base, and the best way to move forward," he said. Rohit thanked AIFF, the club’s head coach Akbar Nawas, the players, supporting staff for bagging its maiden I-League triumph: "It has been a tough four years altogether. Many didn’t believe in our vision, but we stuck to our guts. It’s been a good season and we hope to continue the dream." he said. Hero of the League: Pedro Manzi.